Why is there a bump on our boundary? Have you ever noticed the peculiar step off in the boundary between North Carolina and Virginia at the northwest corner of Gates County? 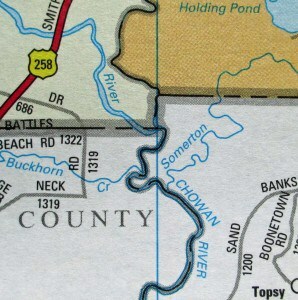 and if [the boundary] happen to cut Chowan River between the mouth of Nottaway River and Wiccacon Creek, then the same direct course shall be continued towards the mountains, and be ever deemed the dividing line between Virginia and Carolina; but if the said west line cuts Chowan River to the southward of Wiccacon Creek, then from that point of intersection the bounds shall be allowed to continue up the middle of Chowan River to the middle of the entrance into said Wiccacon Creek, and from thence a due west line shall divide the two governments. 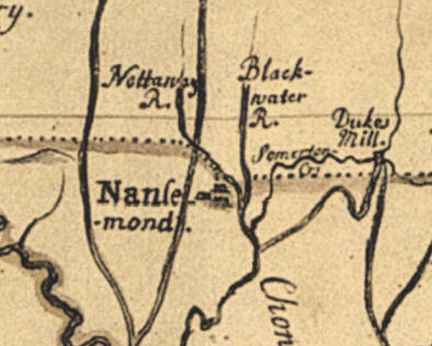 That if said west line cuts Blackwater River to the northward of Nottaway River, then from the point of intersection, the bounds shall be allowed to be continued down the middle of said Blackwater to the middle of the entrance into said Nottaway River, and from thence a due west line shall divide the two governments. 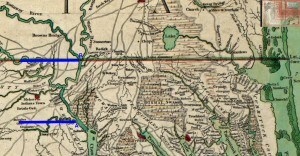 As can be seen from the image below, the boundary could run due west anywhere between the lower blue line (A = Wiccacon Creek) and upper blue line (B = the mouth of the Nottoway River). 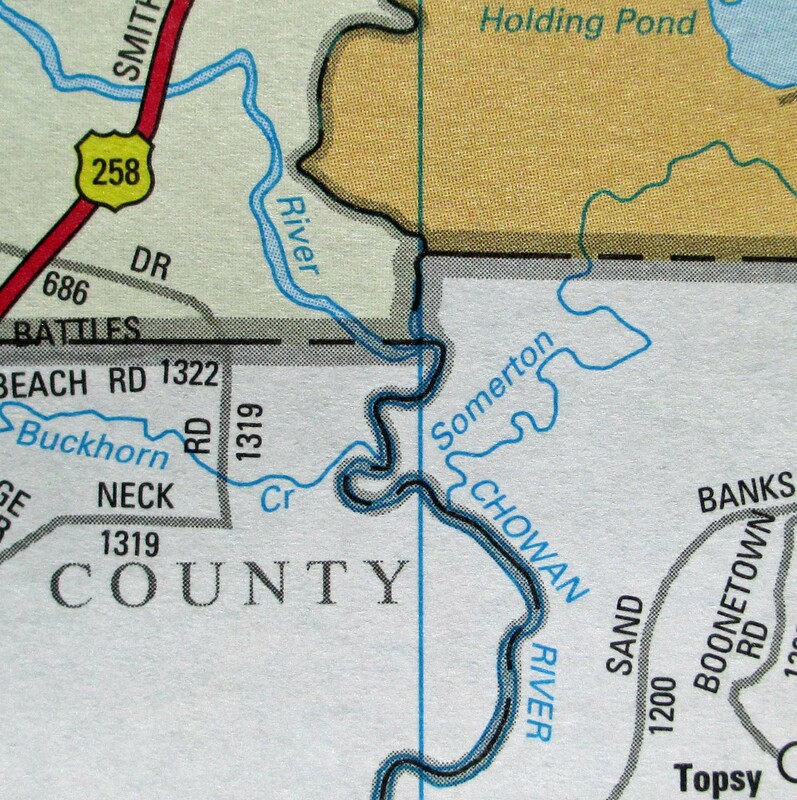 As it turned out, the line did, in fact, intersect the Blackwater River just over 1/2 mile “to the northward of Nottoway River.” Following the above directive, the surveyors ran the boundary down the Blackwater River to the mouth of the Nottoway River and thence due west (line B, above). Thus, the state boundary at the northwest corner of Gates County turns southward for an estimated 2,977 feet. How was this boundary crook represented cartographically? 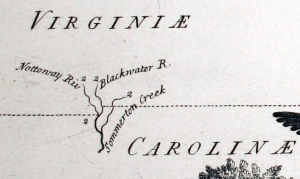 The earliest depiction may have been the beautiful 1728 manuscipt map of the dividing line by North Carolina surveryor and boundary commissioner, Edward Moseley (the image via the link above is from a superb article, published in the Journal of Early Southern Decorative Arts , about a c1737 map of North Carolina). The 1728 manuscript map clearly shows the southward adjustment of the boundary at the Blackwater River. The earliest engraving depicting this jog may have been made to illustrate William Byrd’s History of the Dividing Line. Unfortunately, Byrd’s History was not published until over 100 years later and did not include any of the original engravings believed to be intended for the work. Thankfully, the plates were preserved in the Bodleian Library and strikes were made in 1986. The close up below is from strike 44 of 50 that were printed. It remains the best printed depiction of that peculiar crook in our northern border. This erroneous upward tick in the boundary on Cowley’s manuscript map is very curious since he was the engraver of the printed Moseley map. Such well known maps as the 1770 Churton-Collet, 1775 Mouzon, 1808 Price-Strother, 1833 MacRae-Brazier (and its later derivatives), and the 1857 Cooke map all show an uninterrupted straight line border. All of the official State highway maps from the first in 1916 correctly show the boundary. Addendum: A Map of the British Plantations on the Continent of America, published by Thomas Salmon c1738, is a very interesting map in regards to North Carolina’s boundaries. Relative to scale, it has a very exaggerated NC/VA “boundary bump”, as shown below. It is one of very few printed maps showing the North Carolina and South Carolina boundary as originally decreed (but thankfully never surveyed), i.e. a line parallel and 30 miles distant to the course of the Cape Fear River. That discussion will obviously have to wait for a future blog post. Detail from Thomas Salmon’s A Map of the British Plantations…, showing a markedly exaggerated NC/VA “boundary bump”, and a NC/SC boundary parallel to and 30 miles distant from the Cape Fear River. Image courtesy of the New York Public Library. This entry was posted in 18th Century and tagged boundary, dividing line, north carolina, virginia, william byrd by crmaps. Bookmark the permalink. Wonderfully lucid explication of a murky corner on the line! Great explanation. 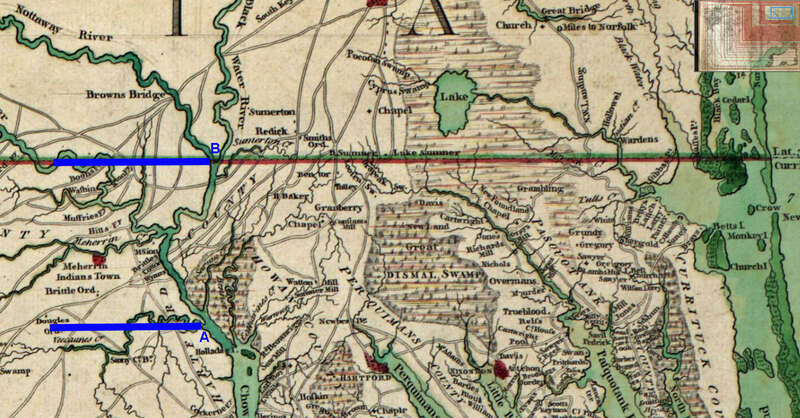 I had wondered about this at footnote 25 in the Land Grant Atlas of Old Orange Co, Vol 2. I had mistakenly thought that the location of this disjuncture in the line was the same place where the surveying crew took a break for the summer of 1728. But in fact their stopping point in the spring of 1728 was at the Meherrin River – a bit further to the west than this spot. Thanks so much for sharing that very relevant snippet from Byrd’s diary. Although I have a copy of Byrd’s History of the Dividing Line, I’m ashamed to admit that I haven’t yet sat down to read it. I just added a map image at the bottom of the original post. It’s an interesting c1738 map of the “British Plantations”, i.e. 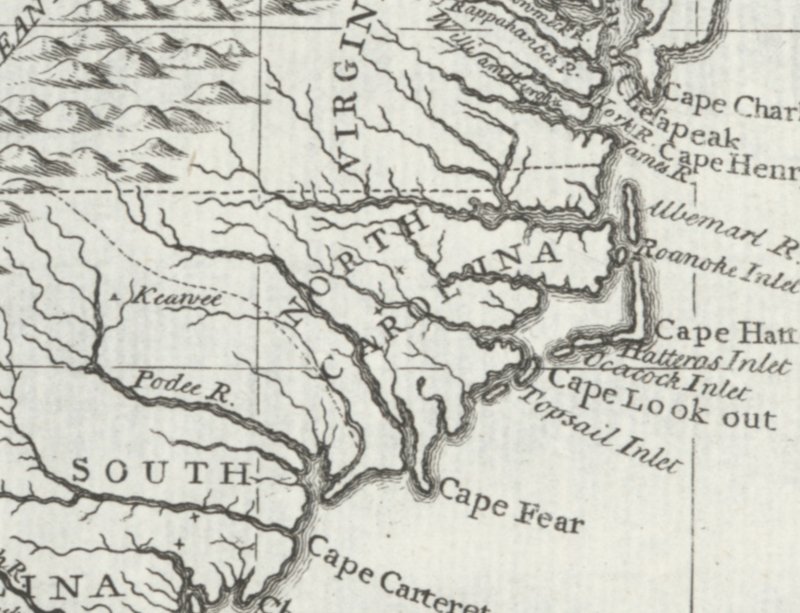 the East Coast, showing an exaggerated NC/VA “boundary bump”, and a rare depiction of the NC/SC boundary parallel to the Cape Fear River. i descend from Edward Mashborne who operated a school in Sarum (1712-1715), He later became an assistant court clerk in Bertie County, NC for Christopher Gale, member of the Dividing Line party. Later, as Chief Justice of NC, Gale appointed Mashborne (or perhaps a son) as Justice of Peace in Onslow County, NC. I am trying to locate the exact spot of Mashborne’s school. Mashborne was the stepson of Elizabeth Nash Mashborne Lloyd. Her second husband Edward Lloyd owned a coffeehouse on Lombard Street in London (a meeting place for insurance brokers who later became known as Lloyd’s of London). In NC, Mashborne was associated with Rev Giles Rainsford of the Society for the Propagation of the Gospel. Rainsford was the son and grandson of Lord Mayors of Dublin, Giles Mee and Sir Mark Rainsford. They owned the St. James Brewery (later famous as Guinness). I am interested in any information concerning the frontier between NC and VA during this time period. I am familiar with most standard sources. Are there any surviving land grant records from that era, either in NC or VA? It’s possible both colonies made land grants in present-day Gates County at the time Edward Mashborne operated the school. Thanks for alerting us to this wonderful bit of NC history.